What has seafood restaurant Fish & Co. have to do with a grocery store in Singapore selling imported South African products? A chewy, peppermint sweet called Endearmints! While its name may sound unfamiliar, it will definitely ring a bell once you see it. This tasty candy is served after every meal at Fish & Co. restaurants in Singapore. Did you know that Endearmints are from South Africa? 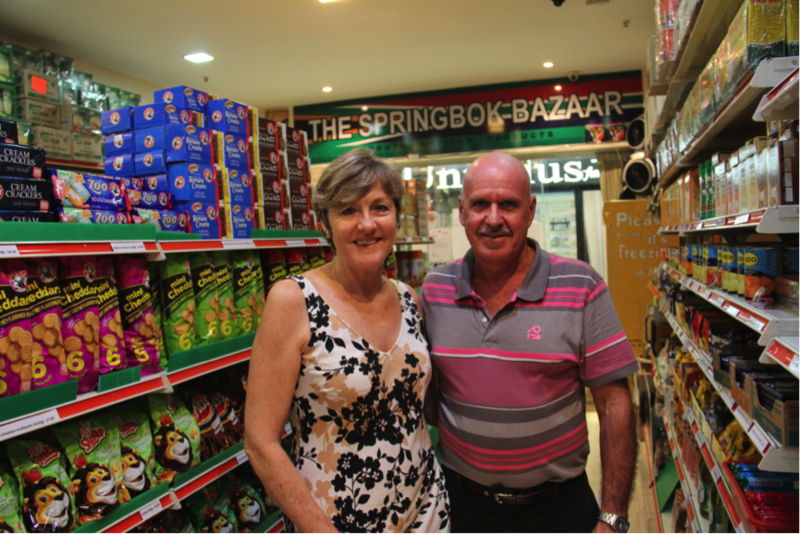 They are so popular that Dave and Cheryl Fisher, owners of specialty grocery store The Springbok Bazaar, ran out of the sweets just two days after receiving fresh stocks! In fact, we hear of folks who will go all out to track down where Endearmints are sold in Singapore! The Springbok Bazaar, located in Bukit Timah Plaza, is a treasure trove, stocked full of mainly South African products such as breakfast cereals, rooibos teas, herbs and spices, snacks, wines, and everything you could need to throw a great South African barbecue (yes, even special charcoal bricks from South Africa!). The Fishers- Cheryl and Dave. 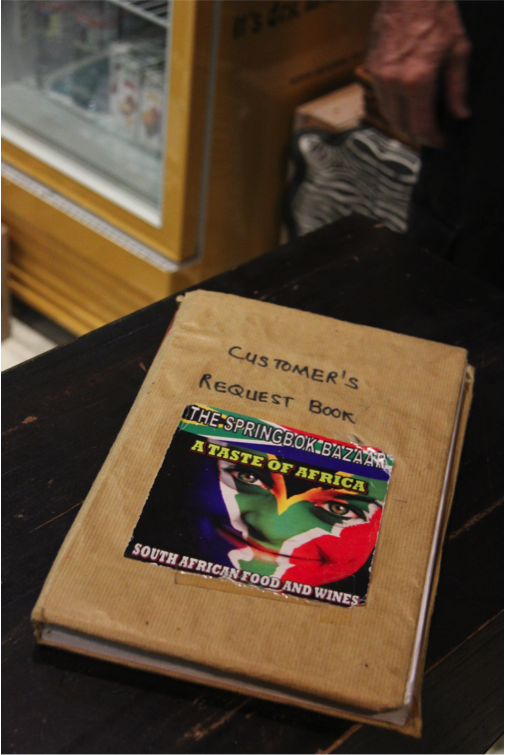 When we walked into The Springbok Bazaar on a late Wednesday afternoon, Dave was focused intently on his laptop behind the counter, updating the store’s Facebook page (“We post new things on Facebook every day. Dave has a weird sense of humour on Facebook,” says Cheryl) while Cheryl was busy chatting with a customer. The Zimbabwe-born Fishers run their store with help from Kurnia, their shop assistant. Cheryl, a former yoga teacher, and Dave, a veteran in the horseracing industry, have been living in Asia for years, many of them spent in Singapore. Since taking over in June 2013 from another couple, the Fishers have been lending their personal touch to the store, from the toddler-sized shopping baskets for little kids, to introducing high quality but reasonably-priced wines, to a guestbook where customers can leave their contact details and personal requests for other products that the Fishers could try bringing in. The store has an online presence, and Dave himself has been making home deliveries to customers. Cheryl tells us of a customer who recently ordered several cases of South African champagne and wanted it delivered to his house that very night. Dave delivered the cases of champagne personally. Can’t find something but you really want it? Write in in here. There is nothing quite like a taste of one’s home country to bring on a wave of homesickness, and to cure it at the same time. For Cheryl, there are three things that she simply cannot do without on a daily basis – Ouma rusks which she and Dave eat every day for breakfast; Mrs Balls Chutney, which is a slightly spicy and sweet chutney made from apricots and peaches; and All Gold Tomato Sauce. 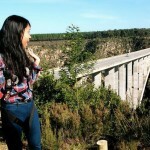 According to Cheryl, these quintessentially South African products items are so instantly recognizable that they are able to conjure images of South Africa alongside other national icons like Nelson Mandela, Table Mountain and Kruger National Park. 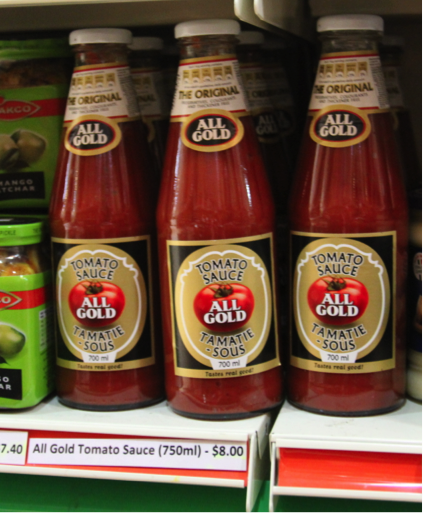 All Gold Tomato Sauce sell for $8.00 a bottle. 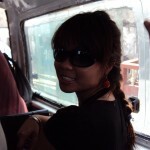 Mrs H.S. Balls Chutney sell for $6.80 a bottle. Choose from different spicyness levels. Ouma Rusks sell for $6.50 a box. Browsing through the aisles, we discovered that not everything on the shelves was exotic and foreign. We saw familiar products like Milo (apparently, it tastes even better than the Milo that we’re used to! 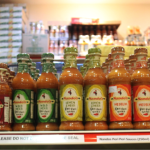 ), Cadbury chocolate and the Nando’s range of peri-peri sauces, from Lemon & Herb to all sorts of spicy pepper flavours. Cheryl generously opened a new packet of biltung for us to try, which is strips of beef marinated in all sorts of delicious herbs, then dehydrated. It’s beef jerky, but better! 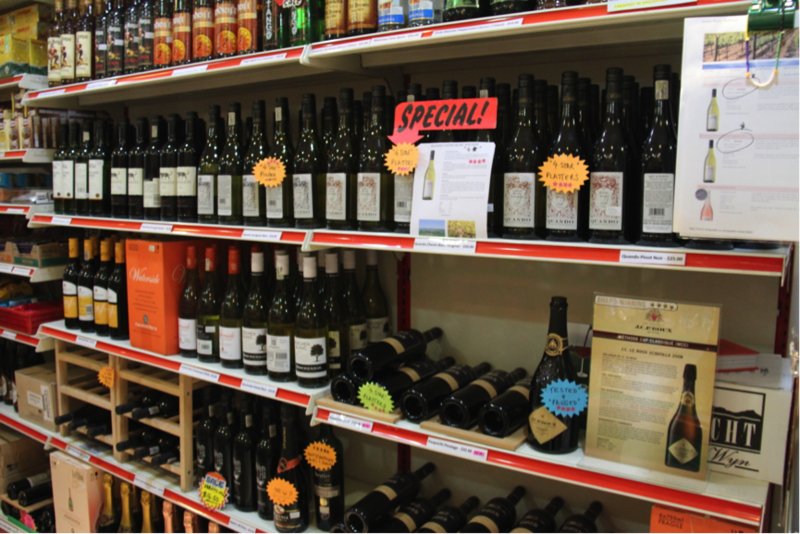 Dave proudly showed us the store’s wide variety of wines, imported directly from the vineyards of South Africa and at prices which you won’t find in your conventional supermarket or wine shop. The Springbok Bazaar carries the familiar Savannah cider, which you can find in any supermarket, but in a bigger bottle and higher alcohol content. We were excited to try the products on offer and bought some treats home with us to try. Our favourites were the Simba potato chips (Mrs Balls Chutney flavor), Spar-Letta cream soda, and Kips crackers which were full of flavor and really crisp. Dave tells us that new products are brought in with each new order, so there’s always something new to discover on the shelves! Dave and Cheryl told us that in April this year, The Springbok Bazaar organised an African Night at local school Anglo Chinese School (Independent) with composer-singer Margeurite MacLean. They provided the party with yummy grub like boerewors, a long sausage wound in a circle and very popular in South Africa. MacLean’s CD can still be bought in the shop. Cheryl also shared with us a list of the 10 most popular products sold at The Springbok Bazaar. 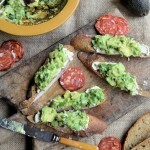 She also shared with us two super easy South African recipes you can try at home – look out for them in our next post! 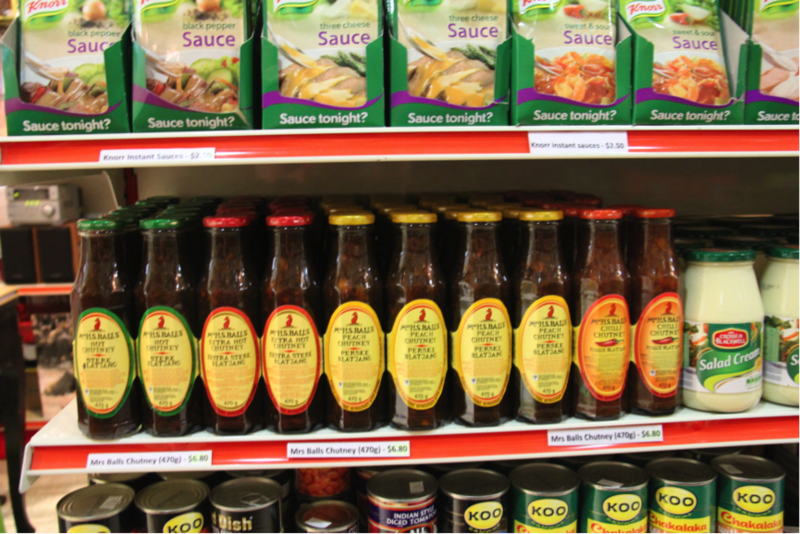 1) Want to give your taste buds a genuine South African experience with the wide range of food products available. 2) Are Muslim or Jewish and craving for new foods to try. The store carries an amazing range of Halal and Kosher food in stock. More than 50% of the shop has foods certified Halal and Kosher. Surprising isn’t it? 3) Travelling to South Africa for work, studies, or volunteer stints and want to get a preview of the products you’ll find there. Cheryl, Dave and Kurnia clearly love their store and the items they bring in, and they gave us a great introduction to South African products. Drop by and say hello no matter what day of the week you visit, as they are there seven days a week, except for public holidays. 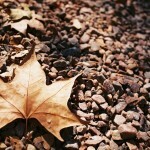 You can also browse through their online store at http://www.springbokbazaar.com/.